NASA Administrator Sean O'Keefe and Associate Administrator for Aeronautics J. Victor Lebacqz came to Oshkosh, Wis., July 28, 2004 to see the huge Experimental Aircraft Association (EAA) AirVenture air show and exhibit, which is supported by a prominent NASA display each year. Image left: NASA Administrator Sean O'Keefe addressed a crowd of aviation enthusiasts at the Experimental Aircraft Association AirVenture event in Oshkosh, Wis., July 28, 2004. EAA and NASA work together on stimulating education programs. O'Keefe complimented the spirit of innovation evident in the many homebuilt and restored classic aircraft displayed at AirVenture. He said the recent successful flight of EAA member Burt Rutan's SpaceShipOne represents just the beginning of an explosion in private sector spaceflight, adding that NASA wants to stimulate that private sector growth. He said the Agency's Aeronautics program -- the first 'A' in NASA --has a role in the new Vision for Space Exploration that focuses on missions to the Moon, Mars, and beyond. He said NASA scientists and engineers have assured him, "If there's a planet with an atmosphere to fly, we'll fly over it." Concepts for a remotely piloted Mars airplane are already taking shape. O'Keefe also said much work remains to be done here on Earth at NASA Aeronautical centers like the Dryden Flight Research Center where so much experimental flight research takes place. In a morning press conference, NASA Aeronautics chief Vic Lebacqz told his Oshkosh audience: "This is absolutely a thrilling place to be ... as we launch the second century of flight." He added, "I'm absolutely beside myself," because there are so many amazing aeronautical sights at Oshkosh. 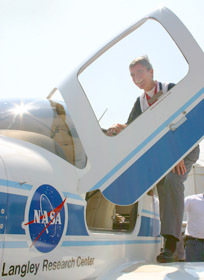 Image right: Vic Lebacqz, NASA's Deputy Administrator for Aeronautics, was in his element at the huge AirVenture 2004 show in Oshkosh, Wis., July 28, where he inspected the NASA Cirrus general-aviation aircraft used to test emerging technologies that could open up a new era in personal flying as a basic means of transportation. Lebacqz said small airplanes and small airports are key to the transformation of the national airspace that must take place to relieve congestion. He said the ability to make community airports a viable part of the airspace system will mean most Americans would live within 30 minutes of an airport capable of serving their flying needs. At the same press briefing, FAA representative Cecelia Hunziker said a demonstration of Small Aircraft Transportation System (SATS) technologies set for next June in Danville, Va., promises to show how this vision of small planes and small airports can work to enhance access to the skies. NASA, the FAA, and a consortium of private groups are working to make SATS a reality. AirVenture runs from July 27 to August 2, 2004 and may attract as many as 800,000 visitors.